Found 3 file extension associations related to DVBPortal MP4Muxer and 1 file format developed specifically for use with DVBPortal MP4Muxer. DVBPortal MP4Muxer is a muxer tool for MP4 streams based on mp4creator. It combines H264 video tracks and AAC audio tracks. Muxes are compatible with Quicktime, Apple TV, XBox and many others. 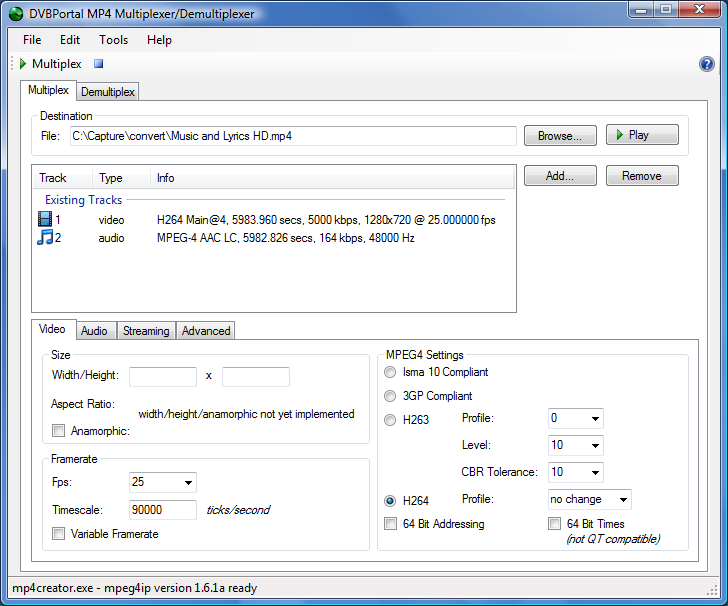 MP4Muxer is the GUI frontend of mp4creator. It provides easy and fast access to mp4creator's complex command line options. Both tools are designed to work seamlessly and fully integrated. If you need more information please contact the developers of DVBPortal MP4Muxer (DVBPortal), or check out their product website.